If your domain name is not pointing to our servers and still on your old hosting provider's space, you might want to upload your data and preview if everything looks and works fine before modifying your DNS to our servers. You can do this without a problem but it will require you to modify your computer's hosts file and force our server IP when you look up your domain. This procedure only allows the computer(s) setup to preview the site. We have an alternative solution to the hosts file modification but requires the previewed domain to be an add-on domain to your account. To preview the content of a website without modifying the DNS configuration of a domain is to (temporarily) force your computer to make the domain point on a specific IP address. Follow these steps. You may also go review the file manually, it is located in here : C:\windows\system32\drivers\etc\hosts . You will surely have to right-click and "open with..."; Notepad would be recommended. Now, yourdomain.com and www.yourdomain.com will resolve to the IP address specified and load what you put on our servers! The procedure becomes a bit more complicated due to common Mac OS restrictions. 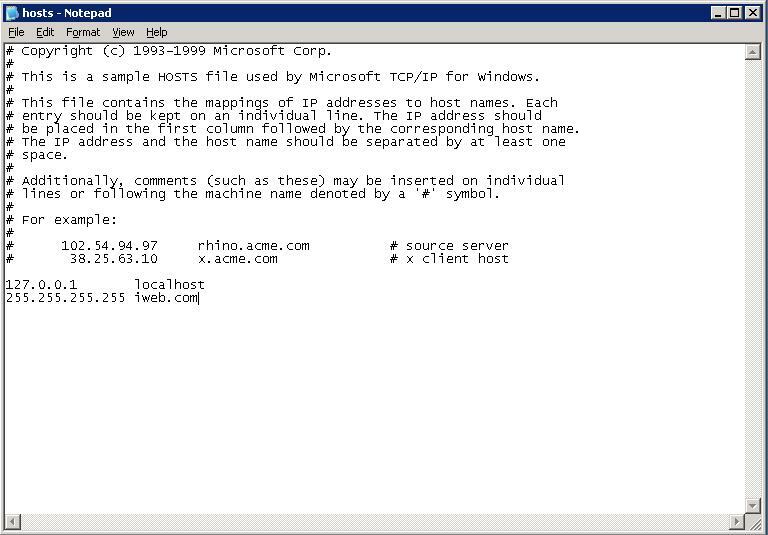 You need to enter these values in the hosts file through a terminal window. First, locate the Terminal, which is found in Applications > Utilities . You can also make a search in Spotlight. You will be prompted to enter your computer password. What you type will not be displayed, so take your time and press 'enter' at the end. 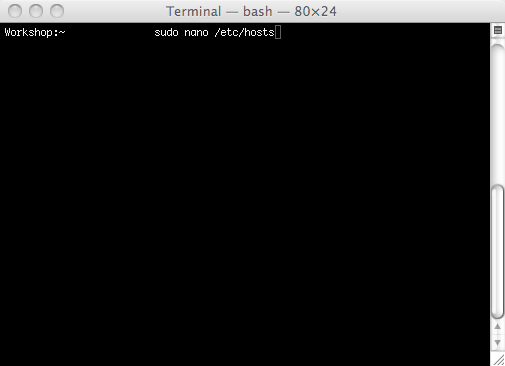 The content of the terminal will change into a terminal style text editor. With the arrow keys on the keyboard, place the flashing cursor under the last entry. Press enter to make line returns. Then, enter the IP and domain name you wish to preview. To save the modifications, you must press the CTRL key and the letter o on your keyboard at the same time. This will prompt a message at the bottom requesting which file to overwrite. Simply press 'enter' on your keyboard. Then, to exit, press CTRL and the letter x at the same time. 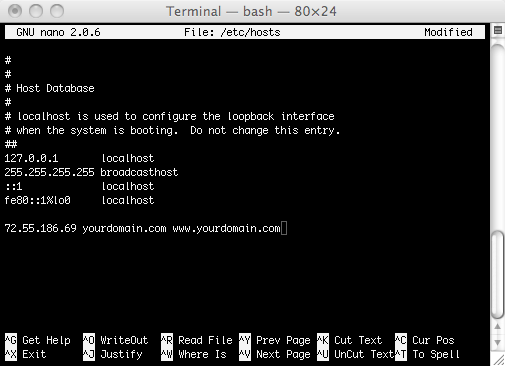 NOTE : Having an entry like that in your host file will override any DNS configuration currently in place, locally on your computer.